Subject: Online generation and recording of Annual Performance Assessment Report (APAR) on SPARROW (Smart Performance Appraisal Report Recording Online Window) for CSS & CSSS Group ‘A’ officers Extension of timelines for completion of APAR for the financial year 2017-18. The undersigned is directed to refer to this Department’s O.M. No.21011/1/2005/Estt. (A) (Pt.II) dated 23rd July, 2009 vide which various date-lines for recording of APARs have been defined. 2. It has been experienced that while recording of APAR for the financial year 2017-18 on SPARROW web portal, some of the cadre controlling authorities of CSS & CSSS Group ‘A’ officers are facing practical difficulties in getting the self-appraisal of the officers under their cadre due to technical reasons and also pre-occupation of Nodal Officers & ORU with urgent time-bound assignments. 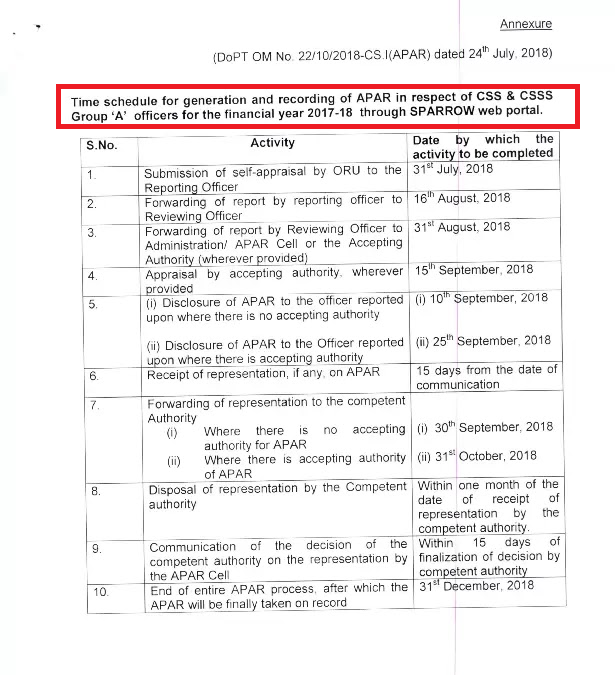 It has therefore, been decided that the target dates prescribed in the above referred O.M., be further relaxed as a one time measure only for online generation, filling up of self-appraisal, reporting, reviewing and acceptance of APAR in respect of CSS & CSSS Group ‘A’ officers for the financial year 2017-18 through SPARROW web portal. The revised target dates for recording of APAR online for the financial year 2017-18 is annexed. This relaxation is subject to the condition that no remarks shall be recorded in the APAR for the year 2017-18 after 31.12.2018. Where the reporting, reviewing and acceptance authority fail to record their comments within the time frame, the officer may be assessed on the basis of the overall record and self assessment for the financial year 2017-18, if he/she has submitted his/her self-assessment within the stipulated time.